Late-emerging Palmer amaranth seedling. Photo taken on July 07, 2017. Figure 1. Soybean field at North Platte, weeks away from reaching full canopy. Photo taken 7/4/2017. 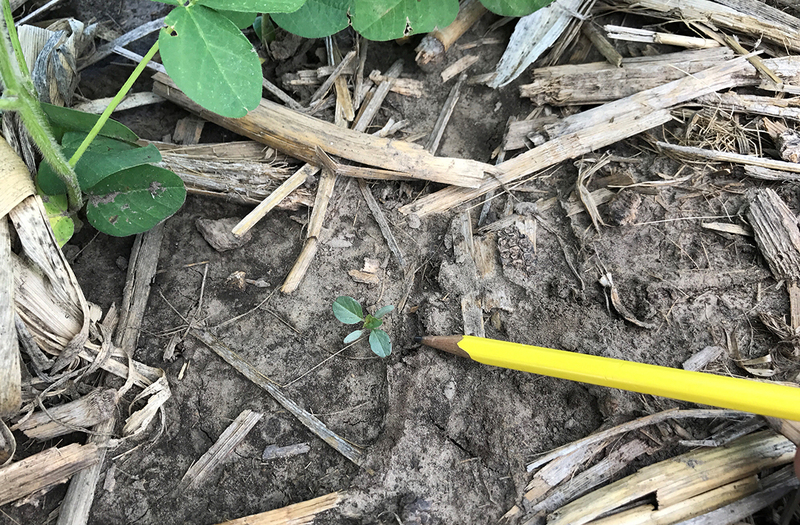 Soil-residual herbicides are encouraged to enhance weed control options in slow-to-canopy soybeans reported across Nebraska. Researchers compare differences between soils fertilized with three types of manure versus commercial products and note four benefits, including an increase in water-stable large macro-aggregates that hold P differently. Are you seeing thinning stands and more weeds in your alfalfa than you'd like? If so, take time out this summer to determine whether you may need to replant the field or rotate out of alfalfa to provide a nitrogen boost for the next crop. Here's a quick guide to assess potential production based on number of shoots per plant. When a new crop disease strikes, researchers dig in to identify its characteristics. Noting how it's similar to and different from other diseases are part of defining it so plant pathologists can better confirm its presence in the field, monitor its spread, and develop appropriate management practices. Here's the story of how plant pathologists identified bacterial leaf streak. Market Journal: View segments on using dicamba, irrigation management, the profitability of precision agriculture, and crop management, hands-on clinics scheduled for July and August. Soil Health Clinic July 18 at Eastern Nebraska REC, Mead. Early bird discount through July 12.